Lidia was the co-pilot of a war-golem serving in Balsii's faction of the Nuqrah'shareh Civil War. Lidia was a female drowolath with a thin build and tainted eyes. She had long white hair left unstyled and wore a close-fitting suit typical of Illhar'dro golem pilots. She wore a large dagger at her hip for self-defense. From what little was seen of her, the Civil War had left her drained and exhausted, seeing little hope in her situation. She shared a relatively close bond with her comrades, and the death of one of them in front of her shook her deeply. Craft's brutal execution of Lidia shocks and angers his foreign allies. Lidia first appeared during the waning phases of the Nuqrah'shareh Civil War. As Chrys'tel led a small team composed of herself, Nau'kheol, Sara'hilana, An'jin, and Craft, the group came across the whispering tower they needed to disable to allow their forces to mount an attack on the district without alerting other districts. However, it was protected by a large war-golem that Chryst'tel recognized from her earlier attack on the isle. Entering the buildings near the golem, they came across Lidia and one of her peers as they attempted to rest. As Lidia's comrade prepared soup for Lidia's co-pilot, he was stabbed in the back by An'jin. Horrified, she attempted to draw her knife to defend herself, but was swiftly disarmed by Nau'kheol. With a blade to her throat, Lidia offered her surrender and informed her captors that the golem cores were the only items worthy of stealing. Nau and Chrys'tel reassured her that they were no looters and that they intended to allow her to leave once they had completed their task. Noting her status as a factionist loyal to Balsii, Sara informed her of the armistice declared by Queen Nega'fanea, suggesting she simply report to the bridge. As Lidia began to explain that she had been tainted, Craft strode forward and summarily executed the unfortunate woman with a heavy sword-blow to her head. The brutal act greatly angered both Chrys'tel and Nau'kheol, but Craft responded with utter derision, noting their status as both foreigners and tainted. Insisting he was not under their command, he stated his adherence to the rigid code of the Dusk clan, a clan known for its zealous pursuit and destruction of any beings wielding or possessed by nether. Only Chrys'tel and Nau'kheol's status as foreign allies spared them of the same fate. With Lidia's death, the group were able to swiftly defeat her co-pilot, as Sara's knowledge of golems allowed her to deduce that the large construct's cores would be near depletion and unable to be recharged without a co-pilot. 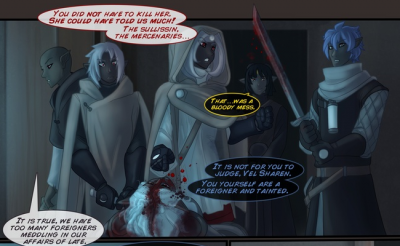 "But... She says the because we got infected that we'd be-" -Lidia's assumptions about her homeland's treatment of the tainted is swiftly proven accurate as she is executed by Craft. This article reflects events up to chapter 55. This page was last modified on 4 February 2019, at 02:39.